Mediatek has provided the LinkIt ONE Software Development Kit (SDK) for developing apps for LinkIt ONE devices. It consists of an SDK that integrates with the Arduino software to deliver a familiar development environment. Read on and learn how to set it up. Mediatek has provided the LinkIt ONE Software Development Kit (SDK) for developing apps for LinkIt ONE devices. It consists of an SDK that integrates with the Arduino software to deliver a familiar development environment. 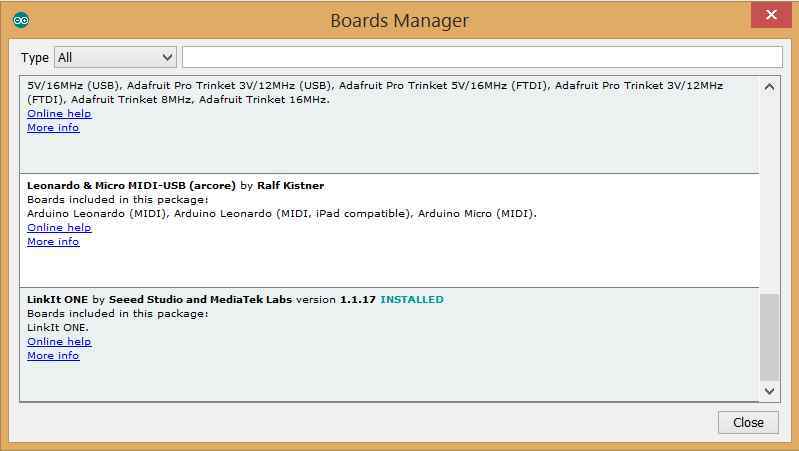 Hence, if you have a recent version of Arduino IDE installed, you can easily add boards through board manager. That’s the easiest way of getting started. Although there are many other ways of installing the SDK, I strongly recommend this one as it is the easiest and bug-free. If you do not havethe Arduino IDE, get it from here. If you are new to LinkIt One here is a brief overview for you — Pointing The Spotlight On LinkIt ONE. What is the Arduino IDE? The Arduino IDE is an open-source development environment that makes it easy to write code and upload it to the board. It is a cross-platform software written in java which deploys code to any Arduino or Arduino certified board. The code we write to interact with physical boards is based on a C like language which is very easy to learn for beginners—which was probably the main reason behind Arduino becoming so popular. With the Arduino IDE version 1.6.4 and greater you can easily add third party boards directly from the stock IDE. Go to Tools, Board, then Boards Manager. You will then be able to select and install the boards supplied by the URLs added to the preferences. LinkIt ONE by Seed Studios and MediaTek Labs is now displayed in Boards Manager. Select the latest LinkIt ONE SDK version and click Install. We have now set up the development environment and are ready to start developing IoT applications with our LinkIt One.